(Natural News) A secretive robot project by Boston Dynamics is turning heads. In a 45 second video titled, “Hey Buddy, Can You Give Me a Hand?” you can catch a glimpse of SpotMini, Boston Dynamic’s robotic dog that can coordinate with other robots, open doors, climb stairs, and even load the dishwasher. The singular robot arm can perform tasks that require stealth and diligence. It can reach into the sink, pick up glassware, and place it in the dishwasher. It can pick up trash and place it in the appropriate bins. The four-legged robot creature moves with precision and is able to navigate up residential stairwells. The robot can even let itself out the front door; the possibilities are endless from there. In the 45 second video, two of the robots coordinated with one another. The first model couldn’t get the front door open. That’s when the second robot stepped in and opened the door, letting them both out. 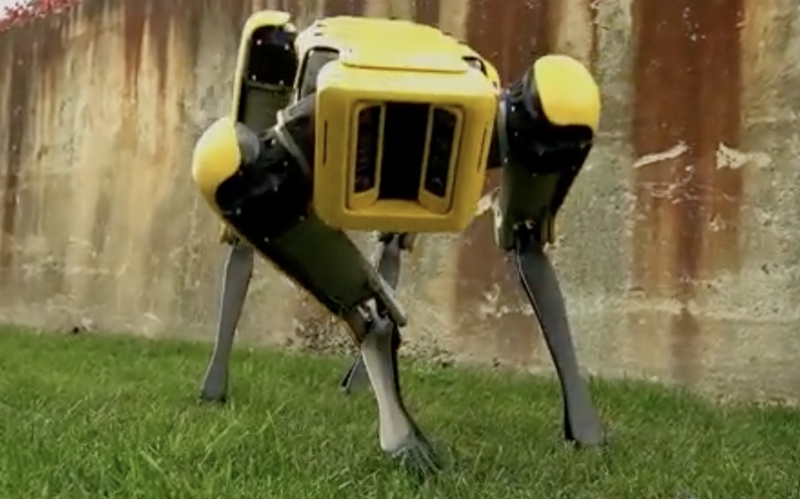 Boston Dynamics says the robot “comfortably fits in an office or home.” In videos, the robotic dog can be seen crawling under tables and freely roaming about a home residence. If it is knocked over, it uses its arm to position itself upright again. SpotMini does not include a battery; it runs for 90 minutes on an electric charge. This design makes it the quietest robot the firm has built to date. It wouldn’t take much for one to waltz its way into someone’s home, quietly make its way through the house, and do whatever it is programmed to do. Its perception sensors and mechanical arm show incredible dexterity. Confiscating firearms: Most law enforcement today would refuse to go door-to-door to confiscate firearms, fearing for their lives, but rugged robot fleets could get the job done in the future, breaking into people’s homes and threatening gun owners to turn over their weapons. In the future, firearms could become ineffective at defending your private property and life due to impenetrable, coordinating robot fleets. Assassinating political enemies: If robots were equipped with weapons and tasked with assassinating political enemies, innocent people wouldn’t stand a chance. By hiring robots, killers could hide behind technology and wouldn’t have to feel remorse or take responsibility for murder. Easy war: If militaries don’t have to feel the human sacrifice of war, then robots will be an easy replacement to conduct the killings. This will make militaries bolder, penetrating territory and taking people out with ease. With robots taking commands, humans become distanced from the remorse of killing; consequentially, killing becomes easier with robots. Expanding the surveillance state: Robots equipped with cameras could be deployed all over the place, keeping watch on human behavior, while policing speech and ensuring conformity to ideas. If you step out of line, an alert system could be triggered and you could easily be tracked down and punished by the people and their robots servants who are in charge at the time.